SJ Asolar - it is elegant and neat template Joomla, released for Joomla 3.x Design with a responsive structure and six beautiful color schemes. 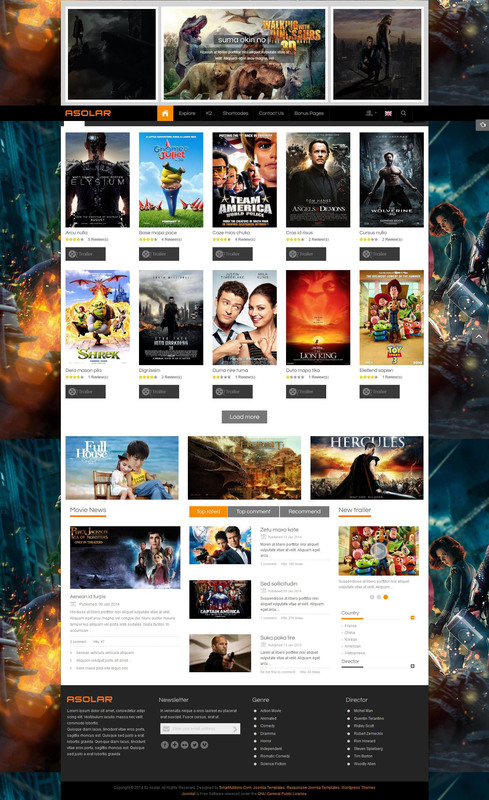 It is a powerful template that is suitable for all types of web sites with the theme of the movie. Visitors will be surprised just flat and beautiful design, high-quality typography, easy navigation and intellectual well designed layout. Responsiveness of this template is best used for projects on film, to promote a movie or theater-sites. With numerous internal extensions created for SJ Asolar, for example, by SJ K2 Carousel news on your website will be displayed in the slider at the top of the screen, SJ Social Media Counter each visitor of the site can subscribe to group your site in social networks.